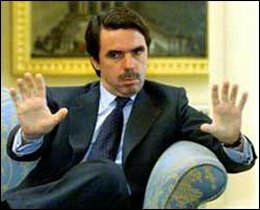 Aznar, on hearing about the responses to the Pope had "not heard any Muslims apologising to me for conquering Spain and staying for eight centuries.". Creatures of his intellectual calibre and broad historical understanding are few and far between in the human race. However, you can easily recognise them since they gravitate around high political and religious offices. "I support Ferdinand and Isabella"